On September 16, CUESA led a farm tour to “the land of milk and honey.” This week’s e-letter is a summary and slide show of the honey part of our tour. The “Flying Bee Ranch” in American Canyon, at the southern end of the Napa Valley, is just the base of operations for Marshall’s Farm Natural Honey. 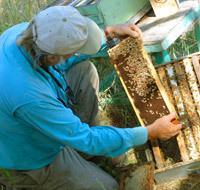 The ranch is the hub, where the honey house and office are located, but most of the action takes place at 600 hives spread out in 100 locations, all tended by Spencer Marshall. It’s not clear who does more traveling: Spencer, traversing Bay Area highways to visit his hives, or the bees, going back and forth from hive to flower gathering nectar and pollen. At the bee ranch, Spencer shows our group a couple of demonstration hives. He cracks open the top, gives the hive a puff of smoke (to keep the bees docile), and then looks inside. He offers us each a veil to protect our faces from potential stings, but is not worried about this gentle hive himself. He searches through the frames and locates the queen bee for us. Her long, shiny abdomen stands out among the fuzzier, striped worker bees. 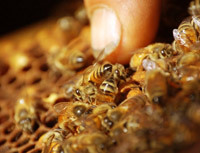 “Some beekeepers requeen [(replace the old queen with a new one)] every year,” he says. Spencer thinks that’s too much work; he’d rather wait until each hive needs a new queen. His preference for natural beekeeping methods also means he loses hives every year to disease, since he shies away from heavy chemical pest control. This year he used one chemical: thymol (found in thyme oil), to ward off the deadly varroa mite. The 100 different hive locations yield honey for over 20 Marshall’s varietals. Some varietals come primarily from a single type of flower, such as Pumpkin Blossom or Orange Blossom, while others are from a certain locale, such as Buzzerkeley or Napa Valley Wildflower. Each harvest is kept separate and transported back to the honey house in wooden beehive boxes called supers, which carry ten frames each. Once in the honey house, one of the best smelling places on earth, the honey is extracted and stored. “We only have three machines that run on electricity here,” says Helene Marshall. First, there is the uncapper, which removes the thin wax caps from the frames. The bees build the caps to seal the cells when the honey has the right moisture content. Frames are placed on the belt and when the power is turned on, they disappear into the body of the machine. A horrendously loud, metallic grating sound issues forth and the frames emerge uncapped. Since the width of the comb is not perfectly even, the thinner parts remain capped and must be scraped manually with a metal comb. The second machine is the extractor. The frames, now uncapped on both sides, are placed vertically into the big metal drum of the machine, which holds about 60 frames. The extractor rapidly spins the frames, emitting a low whirring sound. A light, honey-scented breeze rises through the open top and the honey flies out of the cells by means of centrifugal force. The honey rains lightly against the edge of the drum and drips down the sides to collect in the bottom. It is then released through a spigot into a storage container. Helene says their honey is strained, not filtered, which leaves bits of pollen in the honey. Straining is like using a colander lined with cheesecloth, whereas a filtering mesh is much finer, more like a nylon stocking. The third machine is the warming tank, a giant metal tub that heats water to around 95 degrees. The containers of honey are placed in the warming tank if they crystallize, because honey must be fluid to be poured into bottles. The mellow heat turns the honey crystals back to liquid without heating it so much that the flavor and other beneficial properties are destroyed. Most large commercial honey operations heat honey to higher temperatures. Once the honey is liquid, it is stored in buckets or drums, each labeled by variety and decanted by hand into bottles and honey bears. The wax from the uncapping process is placed into a large wax melter (okay, there are actually four electric machines) that keeps it at a constant 120 degrees. This liquefies the wax, which congeals into globs that can easily be separated from the honey that clings to the wax caps. This honey is Marshall’s only non-raw honey and is sold as the caramelicious Wild West Wildflower blend that is the favorite of many. Like the bees and the cows of Marshall’s Honey and Spring Hill dairy, all the people who have a hand in operating these businesses dedicate a tremendous amount of time and energy to feeding the rest of us. Farm tours and the farmers’ market are places to be reminded of their hard work and to express gratitude for their gifts. For without milk and honey, life wouldn’t be nearly as rich. Thanks to Barry Jan for his wonderful photos! This recipes comes from our Director of Education, Julie Cummins. The recipe originally appeared on the Eat Local Challenge blog. Combine all ingredients and whisk very well (an electric mixer is ideal), making sure the honey is dissolved. 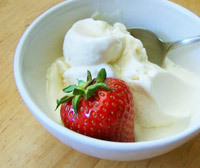 Freeze in your favorite ice cream maker. Serving suggestion: top with berries or other farmers’ market fruit.